This is the hardest one of all to win - if this is on your mantelpiece you really can claim to be the best shot in the club! 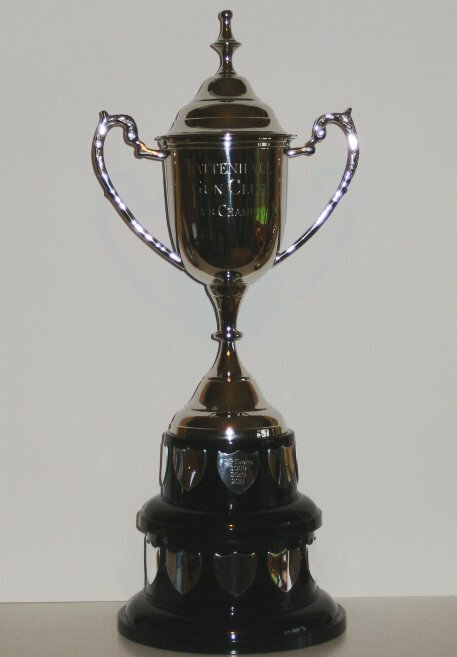 This trophy is awarded at the end of the year to the person who has the highest average percentage score over the whole year, based on the best six scores achieved. See the Downloads page for the current rankings. All of our shoots have a competitive element to them. 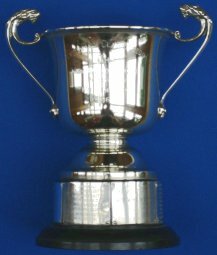 The six winter shoots count towards our Winter Series Trophy and during the summer we shoot for various cups and trophies, often in memory of previous members. With the exception of the Christmas Shoot all shoots offer small cash prizes to the first second and third placed finishers. Please note that these trophies are part of our history as a club and we value them very greatly. As such, only bona fide members are eligible to be awarded custody of the trophies. 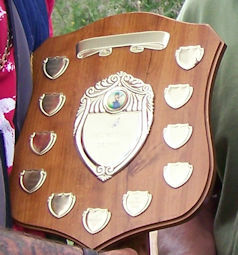 In the event of a trophy shoot being won by a guest, a cash prize alternative will be offered and the trophy will be awarded to the highest scoring club member on the day. 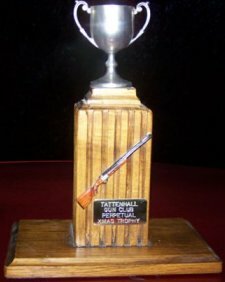 This is our oldest and most prestigious trophy which we shoot for at our May shoot, in memory of one of our founding members. We have been shooting for this beautiful cup since 1966. 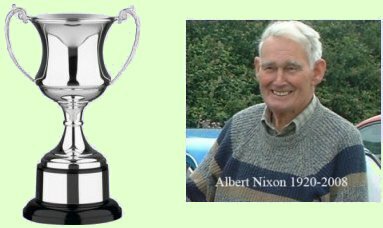 Albert was a very long-serving and highly valued member of the club over four decades. He was also World Veteran Champion at DTL. Albert passed away on 27th March 2008, aged 87 years. We miss him, and we shoot for his trophy at our July shoot. Our June shoot each year is in memory of Phil Morgan (of Morgan Motors, Beeston which is still run by Phil's son, Mark). Phil, a very long standing and valued member of the club, passed away in August 2001 and is still very much missed by the many members who knew him. Phil not only worked tirelessly for the club, but his sense of humour at the shoots and AGMs was legendary. 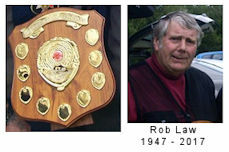 Rob was a founding member of our club and served as secretary for 27 years. Sadly. Rob passed away in April 2012 having shot with us until very recently. This is our only "Double Rise" trophy and is shot for at our August shoot. The Sept, Oct, Nov, Jan, Feb and March shoots count towards our Winter Series. The points system is simple - the winner at any of the shoots is awarded 3 points, second 2 points and third 1 point. Whoever has the most points after the March shoot is the overall winner. Normally on the last Saturday before Christmas we hold our Christmas shoot, which is a 25-bird re-entry (3/2 scoring), and for which there is a special trophy. Our safety rules prevent us from opening any bottles - but we do get through a lot of mince pies. The wearing of silly hats is encouraged! In January each year we make an award to the member who has shown the greatest year-on-year improvement. The nature of this award is that it normally goes to relative newcomers to the sport - but not always! Rob Law shot with this club for almost 50 years from 1968 until his death on 5th March 2017. He very rarely missed a shoot, contributed massively to the running of the club and was a very dear friend to many of the members. 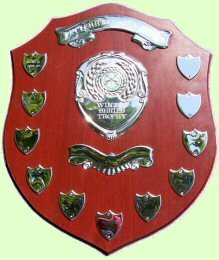 In 2013 he kindly donated this trophy which we shoot for at our April shoot. This is our only single-barrel event and shooting is over 50 (2x25) birds. Rob's passing in 2017 meant that we lost a regular fixture in our calendar which Rob and his family used to host every October. Rob's family have very kindly donated the trophy that we used to shoot for at that event and we now shoot for it at our January 20-bird Double-Rise event.